Seventeen years later, McConnell is still a stalwart champion of shrinking the electorate. But the Senate Majority Leader has grown less forthright with age. Now, instead of defending efforts to restrict the franchise on the grounds that voting is not a right (but rather, a perquisite, which elites like him can extend or withdraw as they see fit), McConnell has decided to go galaxy brain: On Wednesday, the Kentucky senator condemned the Democratic Party’s plan to make Election Day a federal holiday — on the grounds that this proposal constituted an anti-democratic scheme to rewrite election rules in one party’s favor. Making Election Day a holiday is just one piece of HR 1, the hefty package of pro-democracy, anti-corruption reforms that Nancy Pelosi’s caucus passed immediately after taking power. In a Washington Post op-ed earlier this month, McConnell savaged that legislation’s other provisions — including restrictions on nonprofits’ political spending, and increases in public financing for elections to combat the power of big-dollar private donors — as the Democratic Party’s shameless attempts to protect its own political power. But McConnell is actually making a slightly more sophisticated (though no more persuasive) argument: He’s saying that, while virtually all government workers get to stay home on federal holidays, a very large swath of private-sector workers do not — and since federal workers lean Democratic, Pelosi’s proposal would tilt elections in the left’s direction. If it is unfair to hold elections on federal holidays, when the disproportionately Democratic constituency of “pointy-headed bureaucrats” is more likely to have free time than the general public, then surely it is unfair to hold elections on any regular weekday, when the disproportionately Republican constituency of retirees will have much more free time than the median American. Ostensibly, then, Democrats should be able to alleviate McConnell’s concerns by calling for Election Day to be held on a Sunday — or else, by mandating that private-sector employers give all their workers several hours off on the federal Election Day holiday. The Senate Majority Leader would have no reason to oppose to such an idea, unless his objections heretofore have been offered in bad faith. 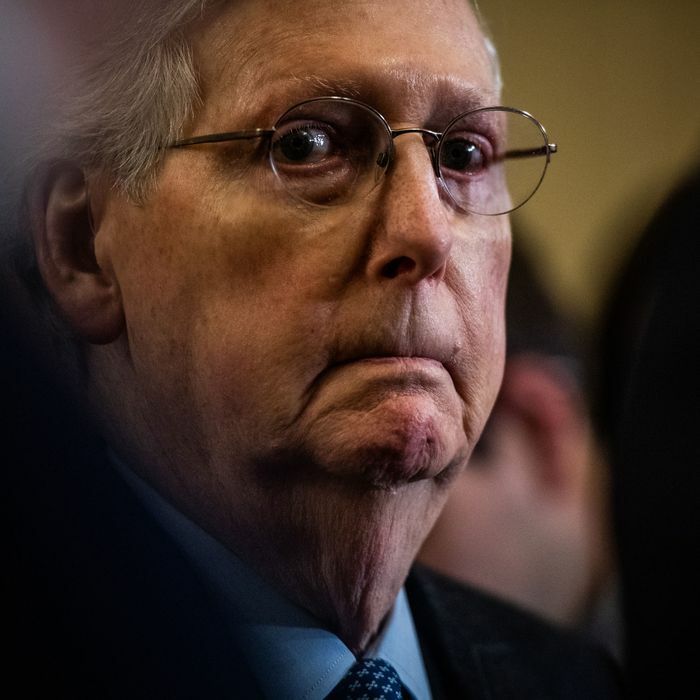 And what cause has Mitch McConnell ever given us for doubting the sincerity of his putative concerns for procedural fairness, or his commitment to popular democracy?